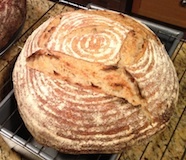 Baking from his book this winter, I've come to appreciate Ken Forkish's practice of growing higher volume levain refreshments and builds than had previously been my habit. I like to feel the warmth generated by, and smell the sweetness of, fermentation in these larger levains, raising them in plastic vessels chosen to minimize the culture's surface-to-volume ratio when it enters log phase. I'm a believer in The Mass Effect and the proof is in the baking: The loaves raised with these levains have been unfailingly delicious. But like many, I don't relish composting so much 'spent fuel'. This week I tested a alternative I'd been anxious to try: Building a dough using all the leftover levain from a bake's refreshments and final build, plus some fresh flour, water and salt. 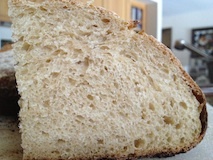 The result was surprisingly satisfying -- a thoroughly delectable loaf that rivaled in flavor and texture that of the 'main bake' from which its levain was merely the remains of the day. I try to refresh my 80% starter twice before the final build -- something I learned from David Snyder. Makes it sweet and active. Each of these refreshments' volume is 200 gr, with the final levain build being 400 gr for my standard weekly 2kg bake. 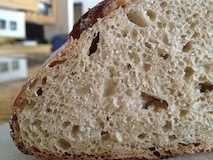 So no, I only bought into Ken F's levain volume excess hook and line -- but not sinker -- sensibly short of his one kg levain builds when only ~240 gr are needed. These three successive cultures, grown over the 36 hr prior to mixing the final dough, leave 180, 160 and 160 gr behind, respectively, a total of 500 gr of 'spent fuel' destined for compost. However, retaining 20 gr from the final build to seed next week's bake's first refreshment, I am left with 480 gr of recently matured levain to rescue and raise a Spent Fuel Boule. For the Spent Fuel Boule, I designed an 800 gr bake based on that prodigous amount of leftover levain, 480 gr. I chose only 55#-sieved durum semolina as the fresh flour, for a few reasons. This organic product, enjoying a recent return engagement in my local food coop's bulk bins, yields a nice flour through the sieve (and the retained fraction, a good peel lubricant), and I've wanted to support the co-op's move by purchasing some. But more importantly, I hoped the durum's sweetness might balance the expected tang of a loaf raised with such a high proportion of cold-stored starter. 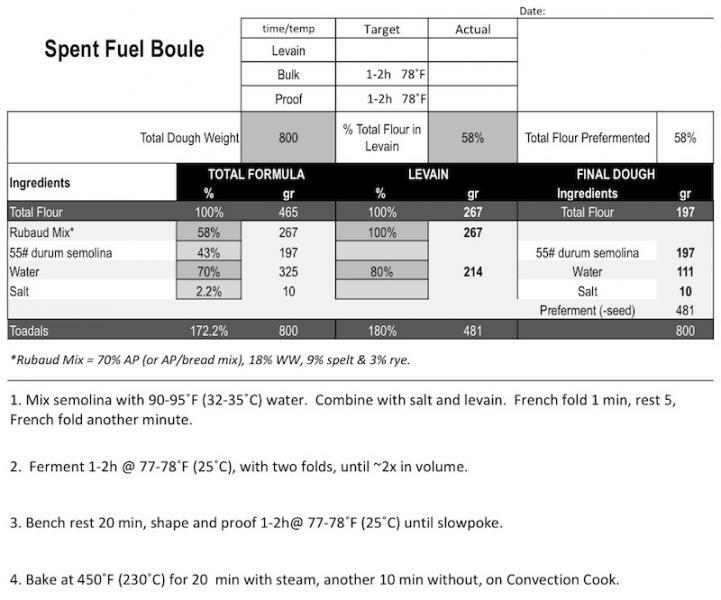 From zolablue's seminal Sourdough Semolina formula, I went with 70% hydration (click on formula below for functional GoogleDoc spreadsheet). One convenience of this exercise was how quick and simple it was. Using such a high proportion of preferment is like time-traveling forward in a normal bake, leap-toading in after bench rest. 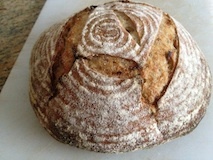 The Spent Fuel Boule could barely be expected to sustain even the short fermentation time of a commercial yeast bake: an hour plus of both bulk and proof, give or take. 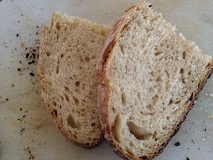 The resulting loaf was a surprising joy -- the mildest of tangs, a nice soft, if durum-predictably close but light crumb. I do all my levain building with Gerard Rubaud's flour mix (thank you, MC), so from that, this loaf had some whole wheat, spelt and a dash of rye from the levain. I look forward to making this or something very much like it part of my routine for all future weekly bakes. My compost will have to satisfy its carb lust elsewhere. ...as the starter for the main bake that left this stuff behind. Starters have signficant shelf life in the fridge, depending on a dozen or so parameters. Starve the compost - feed the bread! 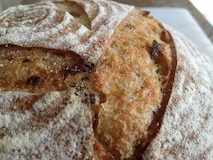 complaint with the Forkish levain builds is throwing 75% of the levain away when it is at the very peak of perfection as much as the 240 g he uses for the bread. This doubles the cost of the flour for the bread - its main and by far the most expensive ingredient. Plus throwing any food away upsets me to no end and usually points to bad planning or paying attention. I'm glad you found a recipe to use it up in a great bread! It has to be tasty bread too. We love the beautiful yellow color and sweetness that semolina gives to bread. Yours looks perfectly baked. Still, I'm certain that I would just scale the levain build amounts in half, still have 240g of the exact levain for the first bread and just save the now much smaller left overs in the fridge for a couple of days - before making another bread out of it that was just more sour due to the retard. Forkish especially does his more naive readers/viewers a disservice by calling starter discarded this way "spent fuel". It's no more "spent" than money in your bank account or fuel in your car's tank. It just hasn't been used yet. As much as anything, this was an exercise to test my fermentation skills -- how to handle a 58% pre-fermented dough. Getting there. Yeah, soft-pedaling the Toady bits lately while I focus on honing fermentation skills. Time to add some o' them toasty dashes. Not all that much wastage to curtail, but fun to make something as nice as this out of it. Nice! you have the best of both worlds, a fast forward baking schedule, and a waste free process. The 'fast forward' aspect of this was great -- assembled while 'main bake' as proofing, with very little effort. One of those "why haven't I been doing this all along?" moments. Kind of a bonus loaf for the day's labors.